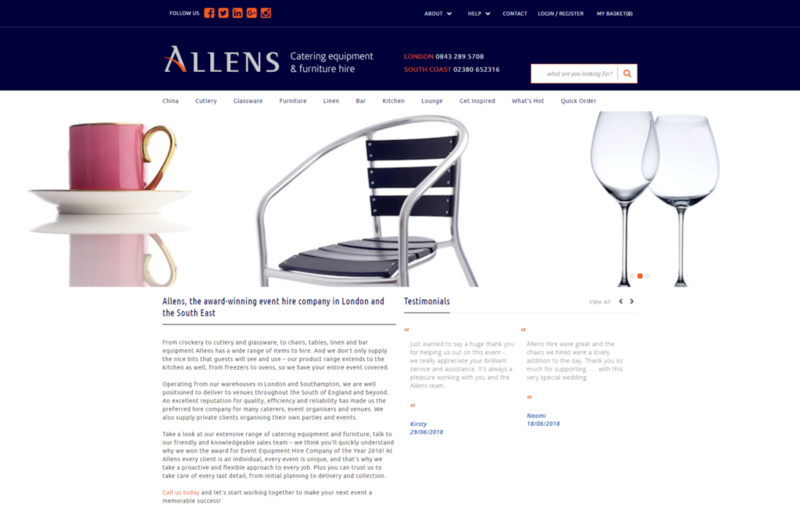 Allens, London’s leading supplier of catering equipment and furniture hire, has won the 2018 Website of the Year at the Hire Awards of Excellence. Bluegrass Digital developed the new e-commerce platform and has been a digital partner of Allens for over 10 years. Every year, entries are judged independently to highlight the achievements of hirers and suppliers and individuals, driving standards within the industry. The main criteria for the Web site award were: ease of use, innovation, and up-to-date information, as well as demonstrating use of social media and other marketing collateral to maximise your Internet presence. Bluegrass Digital managing director Nick Durrant says with the ongoing advances in technology and digital transformation in the industry, it is important that Allens remains ahead of the competition. “Allens not only redesigned its Web site by incorporating its new brand guidelines, but also created a seamless and integrated e-commerce experience for the customer. “This has resulted in better sales automation, order processing and provides customers with access to the latest account, pricing, order information and the ability to make payments via the Web site. The new Web site supports ongoing digital marketing initiatives, increases online ordering and other initiatives in the future,” he explains. Allens managing director Kevin McGuinness says Allens is not an ordinary retail business, it is more complex due to the delivery and return logistics and the number of adjustments to orders before the event. “The overriding business model within the industry has been to have a front-end Web site and back-end administrative system, with sales assistants effectively double entering any online orders,” he adds. “We have worked extremely hard to bring a brand new, full e-commerce Web site to our customers with tremendous capability and a vastly improved user experience. We have now built a system which links the Web site in real-time through to our InspHire hire system, and that is what leading-edge in our industry is,” he concludes.